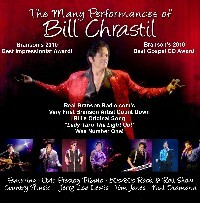 April 13, 2011, Entertainer Bill Chrastil will move his show “The Bill Chrastil Show” featuring the Many Performances of Bill Chrastil to Taylor Reeds, The Tower Theatre. Bill will perform at 10 a.m. Wednesday thru Saturday. The Tower Theatre is located at the Shoppes in Branson Meadows, 4600 N Gretna Rd, Branson MO 65616. Bill includes vocal impressions of Neil Diamond, Tom Jones, Jerry Lee Lewis, Willie Nelson, Roy Orbison and Elvis in addition to Country, Gospel, Classic Rock, 50/60’s and guitar instrumentals during his high-energy show.